Why is full-page scanning helpful to our South American customers? Because of a uniquely Brazilian document called the boleto. Most of us in the U.S. have never heard of boletos, but probably the easiest way to explain them is that they are a clever twist on our idea of billpay here. Boletos are a common form of payment in Brazil. In America, when you receive a monthly bill for, say, water or electricity, you typically have two options: Send a check or money order by mail, or go to the company’s website and pay online by credit card or direct debit. But in Brazil, you’ll often receive a boleto, which is essentially an invoice with a bar code linked to the sender’s bank account. You can take a boleto to any number of designated places – banks, post offices, lotto offices, to name a few – and pay in cash or have the exact amount debited from your account. Because the sender’s account number and other key information is machine-readable, boletos are also well-suited to be paid at ATMs and other automated kiosks, a method that has become popular to avoid the lines and closing times that come with in-person transactions. You may be asking: Why bother with all this instead of just paying online? That may be a legitimate question in the U.S., since Internet penetration is nearly universal and the great majority of citizens have access to some form of card payment, whether it’s a traditional credit card or a prepaid debit card. But in Brazil, where less than half of all residents have Internet access, and even many among the upper classes forego credit cards, boletos serve an important function in commerce. Even for online shopping, nearly half of Brazilians use boletos at least some of the time. It’s also important that Brazil is just in the beginning phases of adopting remote deposit capture (RDC), which will let businesses and consumers scan checks straight into their bank accounts. 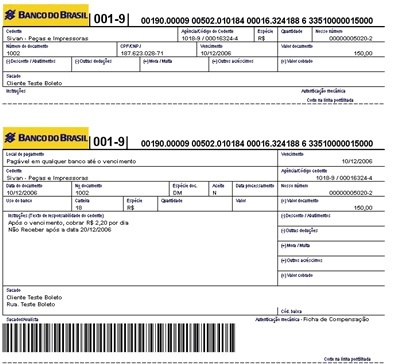 So increasingly, the ideal scanner in Brazil will have two functions: Reading standard-sized checks with MICR, and accepting full-width documents, namely boletos. Of course, any such scanner would also be able to read other multiple-format documents such as contracts, letter, credit forms and more.